Things are looking up for Europe after eurozone GDP turned positive. But headwinds remain. Gross domestic product across the 17-nation eurozone grew by 0.3% in the second quarter, according to official estimates released Wednesday. That's the first time the region has grown since the third quarter of 2011, and compares with a decline of 0.3% in the first quarter of 2013. A rebound in the region's two biggest economies -- Germany and France -- and an easing of recession in the third and fourth largest -- Italy and Spain -- led the return to growth. 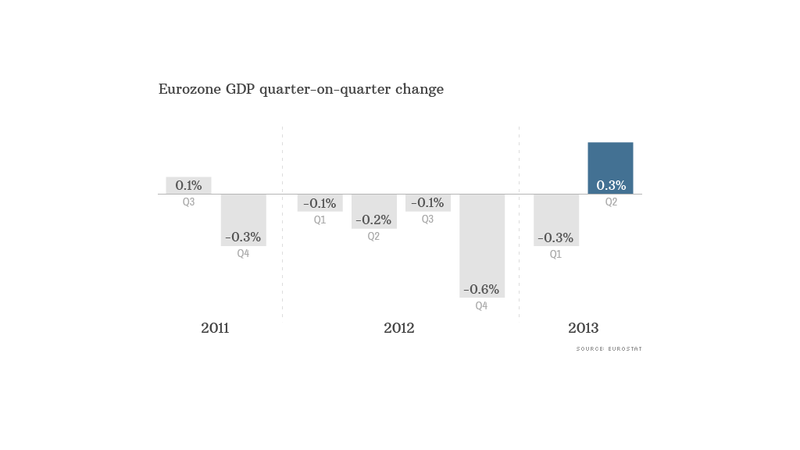 The broader EU economy also emerged from recession, with growth of 0.3% in the quarter. The German economy grew by 0.7%, after stagnating in the first quarter, while France bounced out of recession with growth of 0.5%, the fastest rate of expansion since early 2011 when Europe was battling to prevent a credit crisis tearing the single currency apart. Both national numbers were stronger than most economists were expecting and pushed the overall eurozone reading above consensus forecasts for 0.2%. Related: British housing boom -- or bubble? Consumers and businesses are becoming more confident about spending and investing, thanks to the European Central Bank's cheap money policy and a more relaxed approach to austerity by governments trying to bring their borrowing down. "The ECB's promise to defend the bond markets of reforming eurozone countries has sowed the seeds for the confidence recovery and is helping the ECB's ultra-low interest rate policy to gradually gain traction," said Christian Schulz, senior economist at Berenberg bank. Exports are also beginning to recover despite a mixed performance in other major world economies, with trade contributing to growth in both Germany and France. Latest data from China and Japan show growth slowing, but the U.K. and U.S. economies are accelerating. European markets found support from the data, with major stock indexes posting modest gains and the euro firming against the dollar. But government bonds were little changed and economists cautioned that the second-quarter figure was boosted by a rebound in activity after a harsh winter and may have overstated the region's underlying health. Eurozone GDP is still expected to shrink by about 0.6% this year, before growing modestly in 2014. However, there are still many headwinds that could easily throw a wrench into those predictions. Unemployment may have stopped rising but remains at a record high and will continue to weigh on consumer spending. 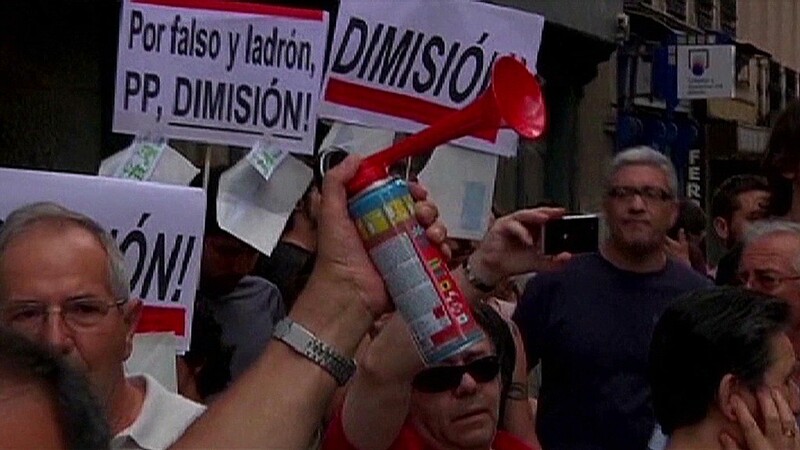 It could also cause political instability in southern European states such as Greece and Spain. Some spending cuts and tax rises have been canceled or deferred but overall eurozone government debt is above 90% of GDP and rising, meaning tight budgets for years to come. Credit conditions for households and businesses remain tight, particularly in the crisis-hit countries of southern Europe, and the slow pace of European banking reform will make for only a gradual improvement. And four eurozone countries -- Greece, Portugal, Ireland and Cyprus -- are still dependent on rescue loans from the EU and International Monetary Fund. Portugal has been struggling to meet the terms of its bailout but the country should find some relief after recording growth of 1.1% in the second quarter, the first expansion since the end of 2010 and the strongest rate in the EU. However, Greece remains a big risk. The IMF identified an €11 billion funding gap in its bailout program, reviving talk of a possible second "haircut" for lenders.